A detail from the Myco Logic exhibition, part of the 2017 Big Anxiety Festival. From above, they look kind of twee, a colourful collection of hand-crafted mushrooms and other fungi. Underneath is a tangle of twine, a representation of root structures that communicate between species and transmit nutrients beneath the forest floor. 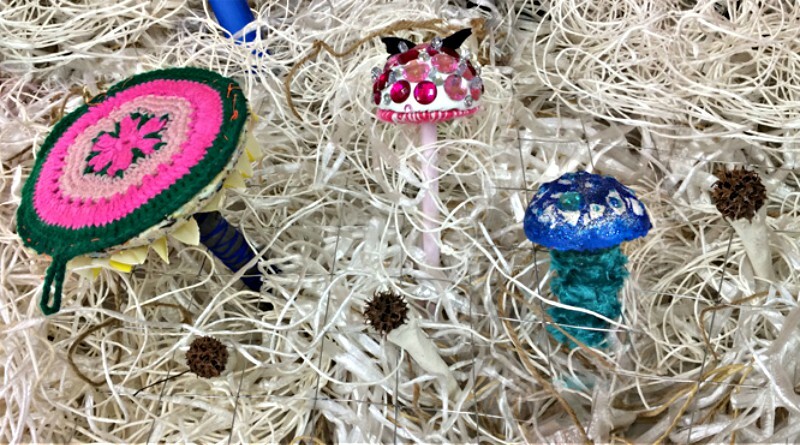 But you can forget twee – the message of the Myco Logic exhibition by Dr Elizabeth Day is anything but. Part of The Big Anxiety Festival, the work likens the communicative root system to communities and the way people function within them. Connection is at its heart. Myco Logic was created with consumers, carers and families at Lifeskills Unit at Cumberland Hospital. It will be on show at the Heritage Courtyard Pavilion in the Parramatta Justice Precinct from October 14-21, and will include workshops on October 16 and 30 and November 13. Curator Claire Taylor describes participation in the project as “a way of interconnecting people”. “The project was a unique opportunity to work with the long-term consumers at Cumberland Hospital to foster connections between them and strengthen their support networks in the process of making the artwork,” she said. The exhibition will include artwork made at Cumberland, as well as artwork made for the Cementa 15 regional arts festival in Kandos in 2015. INVISIBLE WORDS/INVISIBLE WORLDS – an ongoing work by Dr Day – will be exhibited in the pavilion at the same time. It includes works inspired by the Parramatta Girls Home, the Norma Parker Centre, Parramatta Gaol, the Female Factory and what used to be called the Lunatic Asylum and is now Cumberland Hospital, and the invisibility of the people locked up in them. More information about Mycore Logic can be found here.